After our prior day of relaxation at the pool, we woke up the next morning feeling energized and ready to see a few wineries! Lucky for us, or me (I'm not sure that Jon was as stoked :) ), the Carneros Inn has awesome complimentary bikes for their guests to use. I'm talking tomato red and mint green cruisers...with baskets! And since we were located close (riding distance) to a few wineries, this was our mode of transportation. It was so incredibly fun--I felt like a kid again! Riding past rows and rows of grapes on our way to our first stop, the Michael Mondavi Family Winery. We had a fabulous lady named Joe do our tasting, and we enjoyed it all for free since we were staying at the Carneros Inn...the perks just kept coming! The Michael Mondavi Family Estate. I'm telling you, riding a bike around the vineyards is the best way to see it all. Our next stop on the wine tour was Artesa. This place was beautiful. Set up on a hill overlooking Napa Valley, it wasn't the best for our bike legs, but the views were so worth it. The sculpture installation leading up to the entrance. Honestly, it was just as much a sculpture garden/museum as it was a winery. Beautiful. We had a little photo opp on our pit stop up the big hill. I'm happy to say we made it up almost the entire way riding our bikes--thank you spin class! Looking out onto the mountains from the front door of Artesa. Seriously, how beautiful is this landscape? After sampling some yummy wines at Artesa, we were back on the road heading to our "home" for the week. Of course, there was more scenery to take in on along the way. 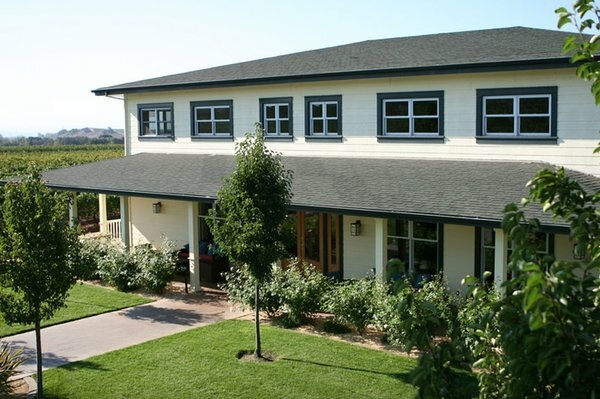 We had asked the staff at the Carneros Inn for some recommendations for an Italian restaurant prior to leaving on our bike/winery tour. When we stopped back in to see what they suggested for us, they told us it had all been taken care of and handed us a piece of paper with the reservation information and directions to restaurant. They truly know how to take care of their guests. And their recommendation was spot on. It was an Italian restaurant called Oenotri in downtown Napa, and the food and atmosphere were excellent! I ordered the Spaghetti con Polpette (basically spaghetti and meatballs-my favorite meal in the world) and Jon ordered the Stuffed Brace of Quail. Their menu changes daily so I can't ensure that those items will be on the list when you visit, but if they are, they are great choices. For dessert, we tried out a local ice cream place that was recommended by some of the pool staff at the Carneros Inn. It was called Three Twins Organic Ice Cream, and it was scrumptious! The final installment of our trip will be coming up soon!